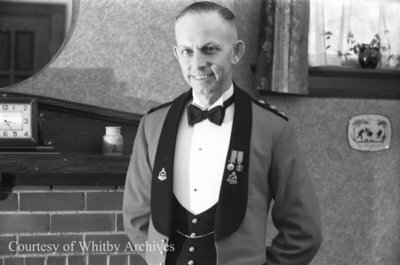 A black and white negative of a portrait of Clayton Alexander Freeman in his dress uniform taken on December 11, 1938. In this view he is standing with his arms behind his back. He is smiling at the photographer. Clayton Alexander Freeman, December 1, 1938, Marjorie Ruddy. Whitby Archives A2013_040_675B.